The Last Stop station is open on Thursdays in the corporate dining café of AllianceBernstein in New York. Last Stop station optimizes branding and regional food trends. When space for a new station opened in On12, the corporate dining café of AllianceBernstein, foodservice management team Restaurant Associates saw an opportunity to reinvigorate the existing foodservice at the New York City location. “We were just going to extend the sushi station that was next to it, but we thought we could do something new that would really draw people in,” says Josh MacGregor, general manager. The team came up with the Last Stop station, a pop-up food stall that rotates through cuisines each month, features innovative food made from scratch, and is only open on Thursdays. “We usually have two concepts a month based on what’s hot in food trends here in New York City. That way if somebody isn't able to go the first week, they can still get that same item two weeks later,” says MacGregor. To build an exclusive vibe, Last Stop only serves limited quantities – when it’s sold out, that’s it. 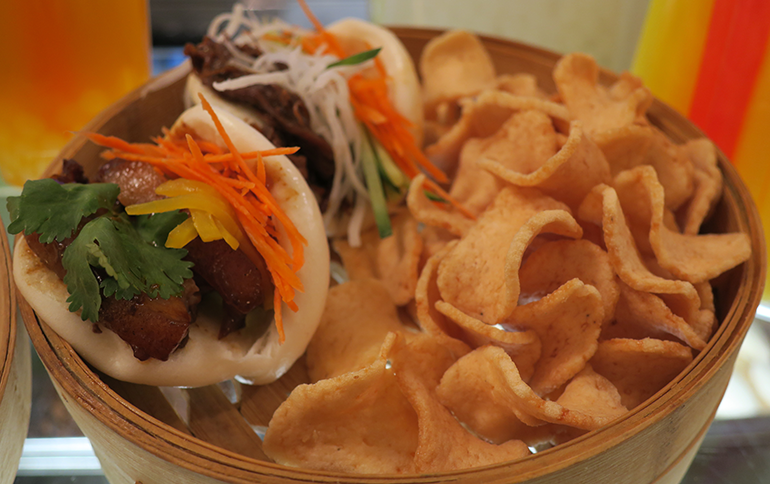 Bao steamed buns come in char siu Chinese barbecue pork and bulgogi beef. Since opening Last Stop at the end of last August, MacGregor says they’ve done a lot of Asian cuisine, which performs well with the 1,800 employees on-site in the Manhattan office. “We’ve done traditional Vietnamese, Chinese and Korean cuisine,” he says, “dishes you wouldn't normally see in a restaurant in the city but things that are trending right now such as Vietnamese noodle salad, which features fresh vermicelli noodles, toppings like vegetables, pork belly and chicken.” They’ve also done Korean-style pork buns, filled with pork belly and served with customized toppings like crispy shrimp chips. Another popular concept, according to MacGregor, was their New York deli cuisine. “We tried to recreate the style of the famous Katz’s delicatessen,” he says. “We did our own corned beef and pastrami, which we smoke in house for at least eight hours.” Before launching the station, the team researched food trends to make sure they had three or four concepts that they knew would do well. Other concepts have included Carvery, K-Taco, Trapizzinos (Italian sandwich pockets), Torta Mexicana and Arepas de Venezuela. Each concept is launched immediately after the previous one ends, allowing the branding of the next concept, which is extensive enough so that each feels like a new food stall, to generate excitement about what’s coming next. To further market the station, the menus are posted on the company intranet, and there are both digital and print signage in and out of the café. To help make each pop-up feel like a self-contained concept, cuisines are also matched with menu extras – bubble tea for Bao and black-and-white cookies and Dr. Brown Root Beer for the New York deli – and station staff where T-shirts with the current concept’s branding. 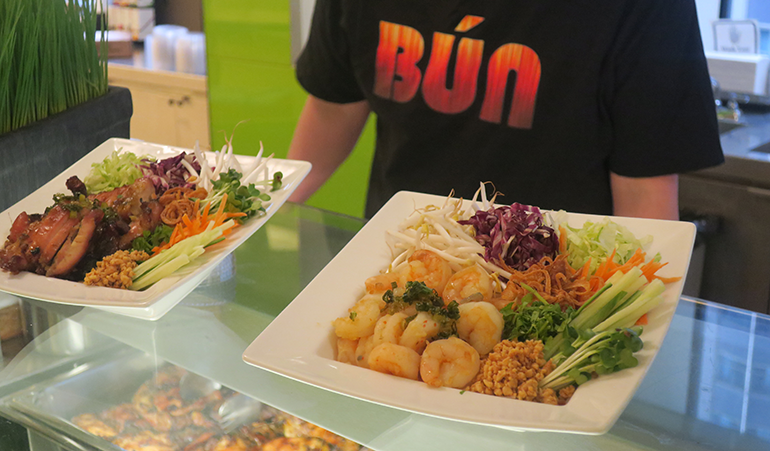 The Bun Vietnamese noodle salad options include lemongrass chicken and sweet chili shrimp. Employees have responded well. With Last Stop, they have a convenient place to grab a quick, affordable lunch that delivers the same excitement and innovation found at restaurants throughout Manhattan – without having to take a cab, subway or walk. By offering it just on Thursdays, says Golden, Last Stop offers variety while not taking business away from the other On12 stations that include a grill, rotisserie, salad, made-to-order deli, sushi, soup and international cuisine. They also didn’t want it to compete with their Chef’s Table concept that runs Mondays and Tuesdays or their special concept on Wednesdays, Tuscan Wraps. 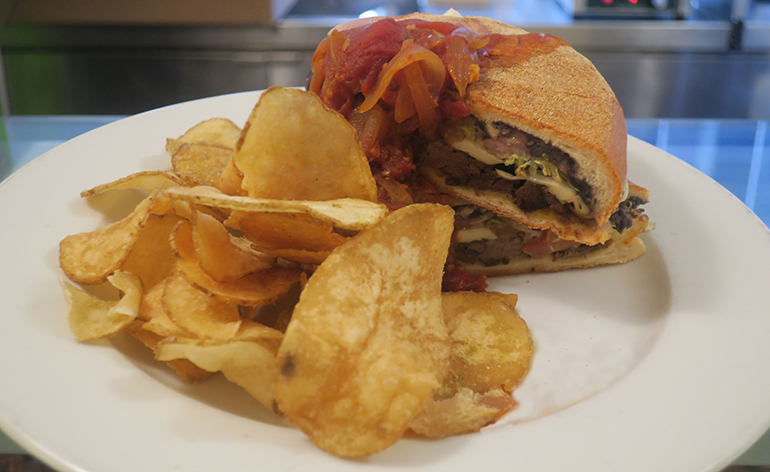 Torta Mexicana servings feature chicken or steak and come with jalapeño chips.